The country's prime minister has said measures have been agreed by her cabinet to tighten gun control laws. NEW ZEALAND’S GUN laws are under intense scrutiny in the wake of the Christchurch mosque massacre in which 50 people lost their lives. Australian man Brenton Tarrant, an avowed white supremacist, legally purchased the semi-automatic weapons he used to shoot dead 50 Muslims, including a three-year-old boy. “We can’t ignore the galling fact he came to New Zealand to buy firearms he couldn’t get in Australia,” Police Association president Chris Cahill said. 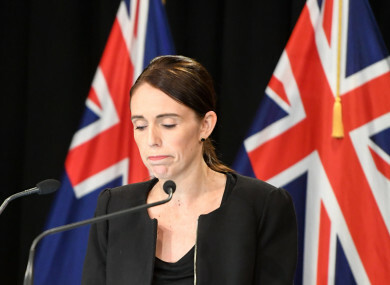 The country’s Prime Minister Jacinda Ardern earlier said her cabinet has decided to tighten gun laws, with details to be announced next week. She said the measures could include a ban on some semi-automatic rifles and a weapons buy-back scheme. Currently anyone over the age of 16 and considered to be “fit and proper to possess firearms” can get a general A-category licence in New Zealand. This allows them to buy firearms including the AR-15 which was reportedly used by the Chiristchurch gunman. This gun is also frequently the weapon of choice in mass killings in the United States. According to New Zealand police data from 2017, the year Tarrant obtained his licence, there were 43,509 applications for a firearms licence with a 99.6 percent approval rate. Around 250,000 people possess firearms licences in the country of under five million. Chris Cahill has called for a ban on easily-modified semi-automatic weapons and the creation of a national gun registry. “As it stands now, we have no idea who’s buying weapons and where they’re keeping them or how many they have in New Zealand,” he said. David Tipple, whose Gun City company legally sold four weapons to Tarrant said he did not feel any sense of responsibility for the tragedy. He said Tarrant was “a brand new purchaser with a brand new licence”. “It was an ordinary sale,” he told reporters, adding that he could continue to sell weapons to anyone with the correct credentials. Andrew Taylor, owner of Shooters Supplies on the western outskirts of Christchurch, closed his store for the weekend after the shootings. He has also removed large-capacity magazines as well as AR-15s and similar weapons from the shelves. The semi-automatic weapons he sold were usually bought by “helicopter guys shooting pests, deer and out of control goats from choppers”, he said. Gun laws were previously tightened in New Zealand in the wake of another mass shooting in 1990, but attempts to push through further reforms have been unsuccessful. The country’s prime minister was flanked by her coalition partner and deputy prime minister Winston Peters when she told reporters that measures had been agreed to change gun control laws. Peters’ party has previously opposed changes, but he said he now backs the prime minister fully. “The reality is that after 1pm on Friday our world changed forever and so will our laws,” he said. Comments are off as a person has been charged in relation to this incident. Email “Spotlight on New Zealand gun laws after mosque shooting ”. Feedback on “Spotlight on New Zealand gun laws after mosque shooting ”.